¡Súbelo Cuba! - Havana Cultura: ¡Súbelo, Cuba!. Vinyl LP. Bleep. 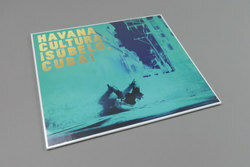 Get ready for a wild ride through contemporary Cuba via famous broadcaster, musical tastemaker and record fiend Gilles Peterson and his Brownswood imprint. ¡Súbelo, Cuba! paints a sonic portrait of the winding back alleys, busy side streets and sun-soaked exteriors of the island through electronic rhythms, traditional musical motifs and heavy duty vocal action. There’s a definite club atmosphere at play here as well with tracks like ‘Companeros Tropicales’ making use of repetitive chants and drums fused with heavy basslines near the latter part of the track. 1 Enciéndelo 3:03 ¡Súbelo Cuba! 2 Compañeros Tropicales 3:02 ¡Súbelo Cuba! 3 Bomba 1:26 ¡Súbelo Cuba! 4 Diáspora 2:40 ¡Súbelo Cuba! 5 Ciclo de la Vida 4:32 ¡Súbelo Cuba! 6 Traketeo 4:22 ¡Súbelo Cuba! 7 Carambuko 3:58 ¡Súbelo Cuba! 8 Soy Libre 2:56 ¡Súbelo Cuba! 9 Number One 3:51 ¡Súbelo Cuba! 10 Encontrándome 3:15 ¡Súbelo Cuba! 11 Blues de Mi Barrio 3:45 ¡Súbelo Cuba! 12 Eshu 3:05 ¡Súbelo Cuba! 13 Hasta Pronto 1:14 ¡Súbelo Cuba!